Stereotactic Electroencephalography (SEEG) is an operative technique used in epilepsy surgery to help localize seizure foci. It also affords a unique opportunity to investigate brain function. Here we describe how SEEG can be used to investigate cognitive processes in human subjects. McGovern, R. A., Ratneswaren, T., Smith, E. H., Russo, J. F., Jongeling, A. C., Bateman, L. M., Schevon, C. A., Feldstein, N. A., McKhann, II, G. M., Sheth, S. Investigating the Function of Deep Cortical and Subcortical Structures Using Stereotactic Electroencephalography: Lessons from the Anterior Cingulate Cortex. J. Vis. Exp. (98), e52773, doi:10.3791/52773 (2015). Stereotactic Electroencephalography (SEEG) is a technique used to localize seizure foci in patients with medically intractable epilepsy. This procedure involves the chronic placement of multiple depth electrodes into regions of the brain typically inaccessible via subdural grid electrode placement. SEEG thus provides a unique opportunity to investigate brain function. In this paper we demonstrate how SEEG can be used to investigate the role of the dorsal anterior cingulate cortex (dACC) in cognitive control. We include a description of the SEEG procedure, demonstrating the surgical placement of the electrodes. We describe the components and process required to record local field potential (LFP) data from consenting subjects while they are engaged in a behavioral task. In the example provided, subjects play a cognitive interference task, and we demonstrate how signals are recorded and analyzed from electrodes in the dorsal anterior cingulate cortex, an area intimately involved in decision-making. We conclude with further suggestions of ways in which this method can be used for investigating human cognitive processes. Epilepsy, a common neurological disorder characterized by multiple recurrent seizures over time, accounts for 1% of the worldwide burden of diseases 1. Anti-epileptic medications fail to control seizures in 20 - 30% of patients 2,3. In these medically intractable patients, epilepsy surgery is often indicated 4,5. The decision to proceed with surgery requires locating the seizure focus, a prerequisite to formulating a surgical plan. Initially, non-invasive techniques are used to lateralize and localize the seizure focus. Electroencephalography (EEG), for example, measures cortical electrical activity recorded from electrodes placed on the scalp and can often provide sufficient information about the location of the seizure focus. In addition, magnetic resonance imaging (MRI) can demonstrate discrete lesions, such as hippocampal sclerosis, the classic pathology seen in the most common form of medically intractable epilepsy, mesial temporal lobe epilepsy (MTLE). Frequently, however, the noninvasive workup is unable to identify a seizure focus. In these cases, invasive electrocorticography (ECoG) with intracerebral electrodes is required to localize the focus and guide further surgical treatment 6. ECoG is a neurophysiological technique used to measure electrical activity using electrodes placed in direct contact with the brain. Grids or strips of surface (subdural) electrodes are placed over the surface of the brain, a process that requires a craniotomy (removal of a bone flap) and large opening of the dura. These surface electrodes can be placed over the putative area(s) of seizure onset. The distal ends of the electrodes are tunneled through small openings in the skin and connected to the recording equipment in the epilepsy monitoring unit (EMU). In the EMU, the patient is monitored for clinical seizure activity through continuous video and ECoG recordings. This technique is useful for collecting long-term (days to weeks) recordings of ictal and interictal electrical discharges over relatively large areas of the cortical surface. While these intracranial recordings are invaluable clinically for investigating seizure foci and propagation, they also provide us with the opportunity to investigate cognitive function and neurophysiology in humans undergoing specifically designed behavioral tasks. ECoG using subdural grid electrodes has been used to investigate various aspects of cortical function, including sensory and language processing. As one of many examples, Bouchard et al demonstrated the temporal coordination of the oral musculature in the formation of syllables for spoken language in the ventral sensorimotor cortex, a region identified as the human speech sensorimotor cortex 7. Furthermore, ECoG with subdural grid placement has also been utilized to study the mechanisms by which humans are able to attend to a particular voice within a crowd: the so-called ‘cocktail party effect’ 8,9. ECoG recordings demonstrated that there are two distinct neuronal bands that dynamically track speech streams, both low frequency phase and high-gamma amplitude fluctuations, and that there are distinct processing sites - one ‘modulation’ site that tracks both speakers, and one ‘selection’ site that tracks the attended talker 5. Another emerging application of ECoG with subdural electrode placement is the potential for use with Brain Computer Interfaces (BCIs), which “decode” neuronal activity in order to drive an external output. This technology has the potential of allowing patients with severe brain or spinal cord injuries to communicate with the world and manipulate prostheses 10,11. While subdural grid placement has contributed greatly to our understanding of superficial cortical areas and is useful in identifying cortical epileptogenic foci, this technique does require a craniotomy and its attendant risks, and is generally limited to studying the outer surface of the brain. Stereotactic electroencephalography (SEEG) is a technique that enables the assessment of deep epileptogenic foci12. With a long history of use in France and Italy, it is also increasingly being used in the US 13. SEEG involves the placement of multiple electrodes (typically 10 - 16) deep within the substance of the brain through small (few mm) twist drill burr holes. 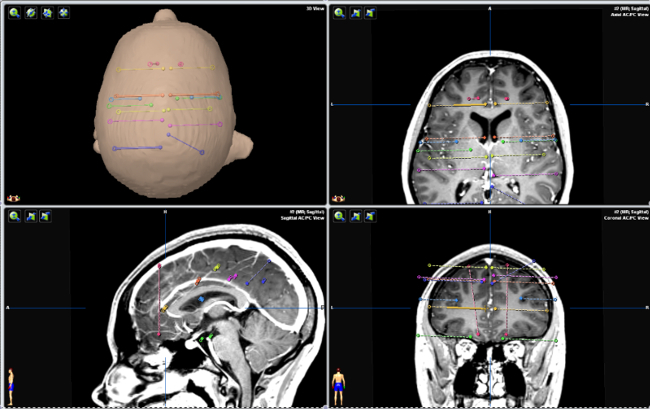 Advantages of SEEG over subdural grid placement include its less invasive nature, the ease of examining bilateral hemispheres when required, and the ability to generate three-dimensional maps of seizure propagation. Furthermore, these electrodes enable the identification of deep epileptogenic foci that were previously difficult to identify with surface electrodes. This procedure also provides the opportunity to investigate the neurophysiology and function of deep cortical structures, such as the limbic system, the mesoparietal cortex, the mesotemporal cortex, and the orbitofrontal cortex, all of which were previously difficult to directly investigate in humans. This paper demonstrates how SEEG can be utilized to investigate cognitive function in the dorsal anterior cingulate cortex (dACC). The dACC is a widely investigated brain region, but it is also one of the most poorly understood. Considered a significant region for human cognition, it is likely that the dACC is central to the dynamic neural processing of decisions in the context of continuously changing demands imposed by the environment 14. 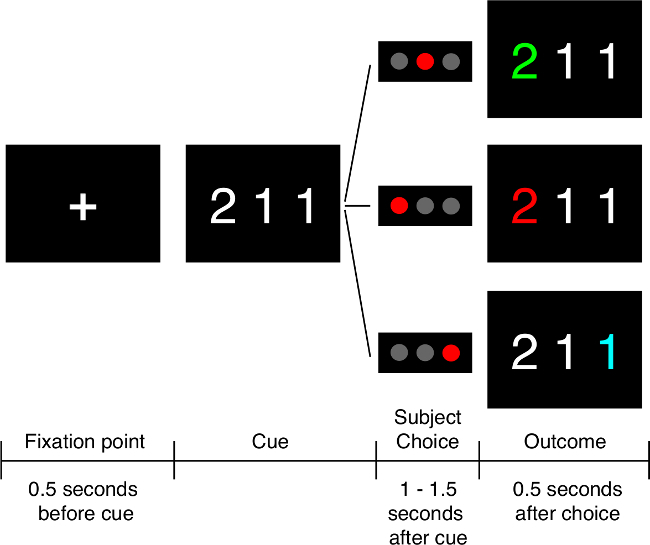 Studies in both primates 15,16 and humans 17 suggest that the dACC integrates potential risks and rewards of a given action, especially in situations of multiple simultaneous conflicting demands18-21, and modulates these decisions in the context of previous actions and their outcomes 14,22,23. The Multi-Source Interference Task (MSIT), a Stroop-like behavioral task, is frequently used to investigate conflict processing in the dACC. The MSIT task activates the dACC by recruiting neurons involved in multiple domains of processing regulated by the dACC 24,25. This task specifically activates the dACC by testing features of decision-making, target detection, novelty detection, error detection, response selection, and stimulus/response competition. In addition, the MSIT task introduces multiple dimensions of cognitive interference, which are utilized in this study to investigate dACC neural responses to simultaneous conflicting stimuli using SEEG. Ensure that each patient is reviewed for suitability for the research study, and appropriate patients must be consented for participation in the study according to local IRB procedures. Note: Epilepsy patients must be clinically assessed by a multidisciplinary team consisting of epileptologists, neuropsychologists and neurosurgeons. Ensure that the patient has medically refractory focal epilepsy, defined as failure to respond to at least 2 adequate trials of anti-epileptic medications. Ensure that non-invasive techniques have failed to localize the epileptogenic foci. Confirm with multidisciplinary team that patient is not suitable for investigation only with subdural grid electrodes. Confirm with multidisciplinary team that there is clinical suspicion of a deep seizure onset zone. Ensure that subject is between the ages of 13 and 65 years. Obtain consent or assent (together with parental consent if below the age of 18 years) from the patient. Ensure that subjects are able to attend to the task and cooperate with the testing. Perform a volumetric T2 and contrast enhanced volumetric T1 MRI preoperatively and transfer the images to the stereotactic navigation software, according to manufacturer’s protocol. Plan the depth electrode targets based on the MRI and clinical suspicion of seizure foci. Note: The examples provided are based on the BrainLab navigation software and are thus specific to this system. However, any stereotactic navigation software can be used to plan depth electrode trajectories and placement. Define the anatomical region of interest as the target point within the “Stereotactic Planning” function in the stereotactic navigation software. For example, use dACC as the target of interest. To define its trajectory, press “New Trajectory,” then press “target” and click on the dACC. Center the target in the middle of dACC by examining dACC in all 3 planes (axial, coronal and sagittal) and clicking on the middle of dACC in each plane. Define the entry point on the scalp within the “Stereotactic Planning” function in the stereotactic navigation software. For example, choose a point on the scalp that appears to be the shortest path to the dACC. Press “entry” and choose the point on the scalp to make the entry point. Click and drag the “target” and “entry” points to modify the defined trajectory to avoid cortical and subcortical vascular structures as well as any potential eloquent cerebral regions. Repeat for all planned depth electrode targets (Figure 1). Admit the patient on the morning of the surgery, bring to the operating room, and induce under general anesthesia26,27. Attach a Cosman-Roberts-Wells (CRW) stereotactic headframe to the patient’s head with skull screws. Obtain a volumetric CT with the headframe in place. Load the volumetric CT and MRI images into the stereotactic navigation software via the “Load and Import” function. Click on the “Localization” function within the stereotactic navigation software. Localize the CRW headframe by clicking on all of the images defined by the stereotactic navigation software as containing the headframe and then pushing the “Assign localizer” button. Click on the “AC/PC Localization” function within the stereotactic navigation software. Identify the anterior and posterior commissures based on their anatomical location. Designate the anterior and posterior commissures via the “Set AC/PC system” function within the stereotactic navigation software. Click on the “Image Fusion” function within the stereotactic navigation software. Merge the CT images with the MRI images in the stereotactic navigation software28,29. Click on the paired volumetric CT and MRI images underneath the “Fusion” tab and then click “Auto Fusion”. Note: This places the MRI within the stereotactic frame coordinates. Click on the “Stereotactic Planning” function within the stereotactic navigation software and confirm the planned trajectories from steps 2.1.2 - 2.1.6. Choose the volumetric CT as the stereotactic reference under the “Stereotactic Functions” tab. Click the “print” icon in the vertical column of icons to print the final stereotactic coordinates for each depth electrode trajectory 30,31. Return the patient to the operating room following the CT scan. Prepare and drape the surgical field using routine sterile methods32,33. Ensure that a fluoroscope is in the operating room and draped along with the rest of the surgical field. Using the printed stereotactic coordinates from step 2.1.20, set the coordinates for the first depth electrode on the headframe. Note: The stereotactic coordinates are given in 3 planes: lateral (x), vertical (y) and anterior-posterior (z). For example, the printed coordinates for a target in the right dACC are +48.2 mm A-P, 6.6 mm Lateral and +2.2 mm Vertical. The headframe is then set to those coordinates accordingly. Extend the guideblock down to the skin and mark the location of the burr hole on the scalp with a marking pen. Fix the guideblock in place based on the stereotactic coordinates and as such, no landmarks are necessary to mark the incision. Inject 2 - 3 ml of 0.5% bupivicaine in a 1:100,000 dilution of epinephrine into the marked incision. Make a nick in the scalp with a scalpel down to the skull into the marked incision. Cauterize the dermis and deep tissue using monopolar cautery directed with a coated obturator in order to minimize any bleeding from vessels in the skin or subcutaneous tissue. Drill a burr hole using a 2.1 mm twist drill bit in the middle of the incision. Open the dura with a rigid obturator probe. Screw an anchor bolt into the skull. Place a pre-measured stylet probe through the anchor bolt to make a track for the electrode. Carefully advance the electrode to the pre-calculated depth. Tighten the anchor bolt cap down to secure the electrode. Repeat this process for all of the depth electrodes. Place the fluoroscope underneath and surrounding the patient’s head in both AP and lateral planes to obtain fluoroscopic images to ensure adequate placement trajectories of all electrodes. Connect the electrodes to the clinical EEG system to verify appropriate impedances. Wake the patient from anesthesia and transport to the recovery room, and subsequently to the EMU. In the EMU, monitor the patient via closed circuit monitoring for clinical seizures and via ECoG for electrographic evidence of seizures. Open behavioral software on computer devoted solely to running the behavioral software. Note: The instructions provided are based on MonkeyLogic, a MATLAB toolbox designed for the presentation and execution of temporally precise psychophysical tasks34,35 and are thus specific to that behavioral software platform. This program is run on Matlab version 2010a and requires the “Data Acquisition Toolbox.” However, any behavioral software platform capable of presenting visual stimuli and recording electrophysiological data could be used. Set the conditions file designed to run the MSIT task to include all four trial types of equal frequency. Note: The MSIT task consists of presenting the subject with a cue of three numbers between 0 and 3, where two of the numbers, the ‘distractors’, are the same and one number, the ‘target’, is different. Instruct the subject to identify the ‘target’ by pressing the corresponding button on a button box. If ‘1’ is the target, the left button is the correct choice. If ‘2’, the middle button, and if ‘3’, the right button. ‘0’ does not correspond to a possible button (Figure 2). Press the “Set conditions” button and choose the desired conditions file set in the prior step. Note: There are two types of cognitive interference that induce conflict during the decision making process. Flanker interference trials occur when the distractors are possible (1, 2, or 3, rather than 0) button choices (e.g., 121), while spatial interference trials occur when the target number’s spatial location differs from the response location (e.g., 200, in which the middle button is the correct response, despite the fact that the target number is in the left position). There are four trial types based on the presence or absence of these two interference types. Test the behavioral display monitor by clicking “Test” in the display box. The display monitor should show the test visual stimulus for 2 - 3 sec. Connect the subject interface device (button box) to the analog inputs on the data acquisition board on the computer devoted to recording the electrophysiological data via three standard BNC cables. Connect the button box to a power source. Connect the data acquisition board to the 512-channel neural signal processor via a ribbon cable split into 9 ribbons. 8 of the ribbons are connected to ports 0 - 7 on the digital I/O portion of the data acquisition board while the 9th ribbon is connected to port 0 on the digital PFI portion of the data acquisition board. Note: The ribbons send 8-bit digital markers (ports 0 - 7, digital I/O) and a strobe pulse (port 0, digital PFI), to the neural signal processor. Set the desired sampling rate in the neural signal processor software. In this example, set the desired sampling rate to 50,000 samples per second, alias and down-sample online to 1,000 samples per second. Adjust the sample rate to fit the specific goals of the task. Sub-millisecond precision timing requires an extremely high sampling rate. Connect the amplifier to the neural signal processor via fiber optic cable. Connect the neural signal processor to the data streamer and the optical PCI card in the neural data acquisition computer via fiber optic cable. Use the research rig for EMU electrophysiology containing a 512-channel neural signal processor for processing and filtering digitized, pre-amplified electrical signals from the depth electrodes. Note: While there are 512 channels for processing, in practice, there are never more than 15 - 20 electrodes placed for clinical purposes. Therefore, we recommend recording from as many electrodes as feasible as data size and spatial resolution is never an issue. Transport the rig to the patient’s room, place the behavioral monitor in front of the patient on a portable table and connect to the behavioral control computer running the behavioral software using a standard DVI cable. Place the recording rig behind or to the side of the patient’s bed in order to remain as unobtrusive as possible. Connect the research system to the splitter box that separates the research recording from the clinical system. Control recording parameters using the neural signal processor software34,35. Note: This system enables sub-millisecond control over behavioral events34,35. Synchronization between neural and behavioral data can be accomplished with either analog pulses coding for task events or digital markers. Both signals can be sent from either the digital or analog outputs on the data acquisition board to the analog or digital inputs on the neural signal processor. Hand the patient the subject interface device (button box) and give task instructions. Click “Run” to run the task. Allow the patient to complete 2 blocks of 150 trials each. Open software package that allows for visualization of electrophysiological data. Note: The instructions provided below are specific to Matlab version 2010a but any software that allows for visualization and manipulation of electrophysiological data can be used. Open .edf file containing raw electrophysiological data from the trial session. Visualize SEEG signal from the session to ensure there is no visible artifact such as epileptiform discharges or movement artifact (Figure 3A). Overlay the timing pulses from the behavioral task onto the raw LFP trace (Figure 3B) to illustrate how analog pulses can delineate trial structure. Using the timing pulses, align the SEEG trace to cue presentation for each trial (Figure 3C). Remove outliers (>4 standard deviations) and artifact traces (Figure 3D). Save all aligned trials in a matrix for further analyses (20 trials shown stacked in Figure 3E). Average LFP activity across trials to reduce effect of noise, artifact, or EEG activity not related to the presented stimuli, and to increase the signal of interest (Figure 3F). Create the raw, trial-averaged spectrogram using multi-tapered spectral analysis36-38. Note: Time-frequency analysis can be used in order to investigate the specific spectro-temporal dynamics across single or multiple trials. This method enables the investigation of neuronal oscillations at different frequencies over time. Pad the signal from each trial with zeroes to the next largest power of 2 to avoid edge effects. Apply a 800 ms sliding window with 5 leading tapers and a time-bandwidth product of 9 every 10 ms through the duration of the signal to create the spectrogram (Figure 4A). Multiply the log of the spectrogram by 10 and normalize to display higher frequency information. Note: Spectrograms can be normalized by a theoretical frequency distribution (i.e., each frequency value raised to the negative 2nd power)(Figure 4B), the mean spectrum of some baseline activity (Figure 4C), or by dividing by the mean and subtracting the standard deviation of the values in each frequency band (Figure 4D). This procedure allows for the examination of specific frequency bands in both raw and normalized forms over time for changes specific to the task. For example, high gamma band activation (70 - 150 Hz), which is shown in Figure 3E, is thought to reflect local excitatory activity of the local neuronal population surrounding the electrode39,40. Once a patient is selected for SEEG electrode placement, he/she undergoes a volumetric T2 and T1 contrast enhanced MRI. SEEG electrode trajectories are then planned using stereotactic navigation of the volumetric MRI sequences (Figure 1). This technique allows for the collection of local field potentials from structures deep within the cortex such as dorsal anterior cingulate cortex (light orange trajectory, Figure 1) that would not be possible with typical surface electrode placement. Post-operatively in the EMU, the patient performs the Multi-Source Interference Task (Figure 2), designed to activate dACC neurons. After an adequate number of trials, the local field potential data from the SEEG electrodes in dACC are preprocessed in order to align the LFP data to cue presentation for subsequent meaningful analysis (Figure 3). In addition, once aligned, the LFP data can be averaged to examine changes in the averaged electrophysiological response between trial types (Figure 3F). Subsequently, multi-taper spectrograms are made to investigate changes in frequency bands over time (Figure 4). As scalp EEG studies have implicated different frequency bands in the activity seen in dACC, time-frequency analysis is an important method to link the electrophysiological changes in dACC with behavior. Figure 1. Planned SEEG Electrode Trajectories Using Stereotactic Navigation of Volumetric T1 Contrast Enhanced MRI. Top left panel. Top down view of three-dimensionally reconstructed face with superimposed planned SEEG electrode trajectories. Top right, bottom left, and bottom right panels. Axial, sagittal and coronal views of planned SEEG electrode trajectories superimposed onto patient’s MRI. Orange electrode trajectories represent implantation into the anterior cingulate cortex bilaterally. Please click here to view a larger version of this figure. Figure 2. The Multi-Source Interference Task. Initially, the subject fixates on a cross in the middle of the screen prior to the cue being shown. The cue is then presented and the subject must identify the “target” number, which is the one number different from the other two numbers presented. The subject indicates the choice with a button push: left button if the target is “1”, middle if “2” and right if “3.” In this example, if the subject presses the middle button, he/she is shown the number “2” in green, indicating he/she made the correct choice. If he/she chooses either of the other buttons, “2” is shown in red, indicating an incorrect choice. 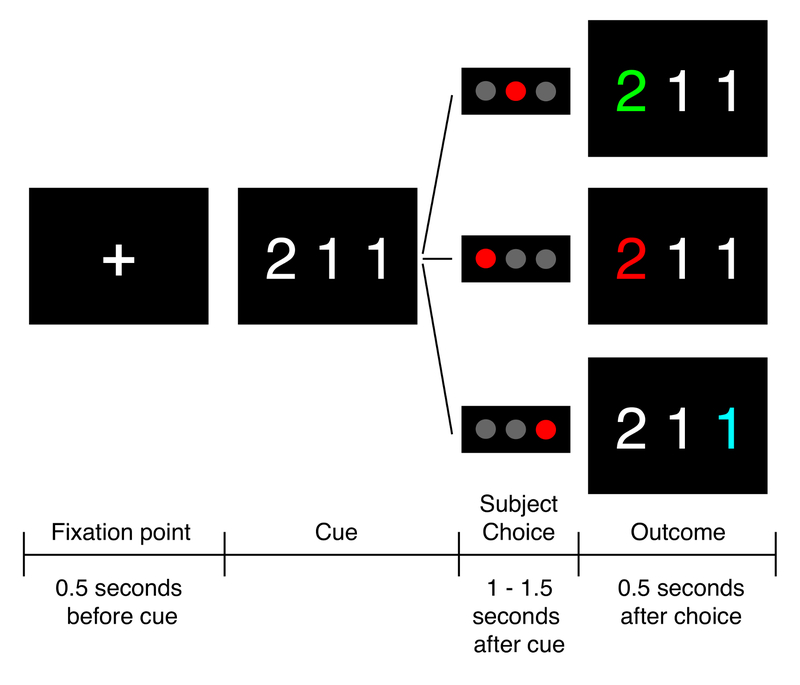 Subjects also undergo trials in which they do not receive valenced feedback about their choice, in which case the “2” is shown in blue regardless of whether the choice is correct or not. Please click here to view a larger version of this figure. Figure 3. Preprocessing SEEG Data. (A) All data recorded from a single channel in the dACC. (B) A minute-long recording from anterior cingulate cortex with overlaid timing pulses for the behavioral task. (C) Data for each trial aligned on the cue presentation. (D) Data for each trial aligned on the cue presentation with outliers and artifact traces removed. (E) LFP from 20 trials aligned on cue presentation and stacked. F. Averaged LFP aligned on cue presentation from a medial prefrontal electrode. Dotted lines represent the onset of the fixation point. Dashed lines represent the cue onset. Dash-dotted lines represent the average response time. Please click here to view a larger version of this figure. Figure 4. Spectral Analysis. (A) Raw trial-averaged multi-taper spectrogram aligned on cue. (B) The same spectrogram in A normalized by 1/f2. (C) The same spectrogram in A normalized by the mean spectrum from 500 milliseconds before the cue. (D) The same spectrogram in (A) normalized by frequency band. (E) Mean high gammaband power for normalized and unnormalized spectra. In all plots, dotted lines represent the onset of the fixation point, dashed lines represent the cue onset, and dash-dotted lines represent the average response time. Colored bars indicate the high gamma bands used in (E). Please click here to view a larger version of this figure. In this paper SEEG was used to investigate the activity of local neuronal populations within the dACC during a decision-making task in humans. Previous work has investigated the activity of individual neurons in the dACC using intraoperative microelectode recordings 14 and demonstrated that dACC activity is modulated by previous activity. Microelectrode studies enable the investigation of the spiking activity of individual neurons. SEEG measures LFPs, which are related to the summated synaptic potentials across a large population of neurons. SEEG therefore allows the opportunity to simultaneously investigate population neuronal activity from several brain regions. When using a clinical technique such as SEEG to investigate scientific questions, it is critical to first ensure that the operative and research plans are aligned. The clinical problem to be solved involves determining the patient’s seizure onset zone and will always take precedence. Because the operative plan is dictated by clinical need, it will not always be possible to investigate the same research problem with every case. Thus, we have developed a series of tasks designed to answer separate scientific questions that can be adapted to the patient’s operative plan depending on the regions being interrogated with electrodes. In this study, SEEG LFP data was utilized to investigate cognitive control over goal directed behavior in the dorsal anterior cingulate cortex, a deep cortical structure in the medial prefrontal region that is difficult to investigate in humans. LFP data acquisition can be carried out with many different systems. A crucial aspect to consider is the sampling rate as this must be high enough to acquire the signals in which the researcher is interested. In general, the sampling rate should be four times higher than the highest frequency band being examined. For example, if the researcher is interested in looking at evoked potentials (<50 Hz), the sampling rate need only be around 200 samples/s. However, if the scientific question involves examining high gamma activity (60 - 200 Hz), the sampling rate should be at least 500 samples/s. Additionally, the system should be able to record enough electrodes as are implanted, and hardware filters on the data acquisition system should not exclude frequency bands of interest. For example, many systems do not record direct current signals. If the researcher is interested in studying very slow signals, he/she should use a recording system with an appropriately low high-pass hardware filter. During the data analysis stage, it is important to remove trials with very large or fast transients and remove channels or trials that exhibit epileptiform activity as normal physiology is very difficult to study in the presence of epileptiform activity. The role of the dACC in error prediction 23,41, processing reward motivated action 15 and in behavioral adaptation in the context of competing demands 18-21, conflicting responses 42 and previous activity 14,22,23, is well established. However, a unified and integrative theory for the specific neural mechanisms by which the dACC modulates cognitive control is still subject to conjecture due to a lack of empirical evidence from human studies investigating these domains simultaneously 43,44. SEEG provides the opportunity to investigate neural activity in the human dACC and therefore contribute to an integrated understanding of dACC function. SEEG affords the opportunity to investigate other cortical areas which may be difficult to access with surface electrodes, such as the orbitofrontal cortex (OFC), whose involvement in the emotional and reward-based aspects of decision-making has been explored in studies using single unit recordings in macaque monkeys 45 and connectivity studies in humans using diffusion-weighted imaging tractography 46. While these studies have contributed to the theory of OFC function in human decision-making 47, there is a scarcity of literature in humans studying OFC function specifically 48. SEEG provides the opportunity to address this knowledge gap. Furthermore, SEEG can be used to demonstrate the function of different regions of the limbic system, a collection of deep cortical and subcortical structures involved in processing emotion, pain, fear and negative affect. One such SEEG study investigating the response of the limbic system to expressive faces has demonstrated that the hippocampus and amygdala contain specific neuronal populations that distinguish happy from fearful faces, while amygdala neuronal populations appear to track the subjective judgment of these emotional faces 49. Dysfunction in these regions is believed to be implicated in anxiety disorders 50 including obsessive-compulsive disorder 51, and SEEG studies provide the opportunity to understand the affected neural pathways and pathophysiology of these disorders in more detail. Furthermore, SEEG can be utilized to investigate the precuneus, a site that is often targeted during SEEG epilepsy investigations, but rarely covered with subdural grid implants. The function of this region of the postero-medial parietal lobe is poorly understood, primarily because of its anatomical location deep within the interhemispheric fissure. Functional imaging studies have shown that the precuneus is active in the ‘default mode’ or conscious resting state 52, in self processing 53-55, and in episodic memory processing, including for autobiographical memories 56,57. However, since these findings are based on limited studies in non-human primates and humans, our understanding of the neurocognitive importance of this region is still in its infancy 58. With SEEG, we now have the potential to investigate neuronal activity within the precuneus in awake humans, which may provide novel insight into the function of this brain region. As with any technique, SEEG has limitations in both its acquisition and use. As a clinical technique, it is necessarily limited by both patient selection and the clinical nature of the patient’s epilepsy. While researchers can design a number of tasks to work around this limitation, the anatomical regions studied will always be limited by the operative plan. In addition, as previously mentioned, SEEG record local field potentials, which represent the summed synaptic potentials of many neurons. Thus, this technique does not have the spatial resolution of single neuron recording techniques and cannot provide data on spiking activity or action potential waveforms. As such, when designing tasks to investigate scientific questions, it is important to ensure that LFP data can answer the question of interest. In this paper, SEEG was utilized to investigate deep cortical and subcortical structures that were previously difficult to study in awake human subjects. These studies have the potential to enhance our understanding of human cognitive processes. As SEEG is increasingly incorporated as a tool within the armamentarium of epilepsy programs, the opportunity of neuroscientists to harness its potential to study the human brain will grow significantly. The authors have no acknowledgements or financial disclosures. BNC cables for analog pulses Can be ordered from most electronics stores. Custom made button box - human interface device Any human interface device with three buttons may be used. Alternatively, 3 keyboard buttons may be used. Subject monitor and associated cables for visual stimulus presentation Dell U2212HMc Most Monitors are adequate here. Mains cable for monitor Usually comes with the monitor, can be purchased at any electronics store. Fiber optics cables to connect TDT systems Tucker Davs Technologies F05 Fiber optic cables for connecting Tucker Davis Technologies' prodcuts. ribbon cable and snap serial connector for digital markers Can be ordered from ost electronics stores. Tucker Davis Technologies splitter box to split clinical and research recrodings Tucker Davs Technologies This splitter box is a semi-custom device. Researchers should consult the attending neurologists about splitting the research and clinical recordings in a way that doesn't interfere with clinical care. Researcher monitor with requisite cables Dell U2212HMc Most Monitors are adequate here. button box power source - 5 volts, 2 amperes Can be purchased at any electronics store. Murray, C. J., Lopez, A. D., Jamison, D. T. The global burden of disease in 1990: summary results, sensitivity analysis and future directions. Bulletin of the World Health Organization. 72, 495 (1994). Berg, A. T. Understanding the delay before epilepsy surgery: who develops intractable focal epilepsy and when. CNS Spectr. 9, 136-144 (2004). Hauser, W. A. Epilepsy: frequency, causes and consequences. Demos Press. (1990). Wiebe, S., Blume, W. T., Girvin, J. P., Eliasziw, M. A Randomized, Controlled Trial of Surgery for Temporal-Lobe Epilepsy. New England Journal of Medicine. 345, 311-318 (2001). Fisher, R. Electrical stimulation of the anterior nucleus of thalamus for treatment of refractory epilepsy. Epilepsia. 51, 899-908 (2010). Zumsteg, D., Wieser, H. G. Presurgical evaluation: current role of invasive EEG. Epilepsia. 41, Suppl 3. S55-S60 (2000). Bouchard, K. E., Mesgarani, N., Johnson, K., Chang, E. F. Functional organization of human sensorimotor cortex for speech articulation. Nature. 495, 327-332 (2013). Zion Golumbic, E. M. Mechanisms underlying selective neuronal tracking of attended speech at a 'cocktail party'. Neuron. 77, 980-991 (2013). Mesgarani, N., Chang, E. F. Selective cortical representation of attended speaker in multi-talker speech perception. Nature. 485, 233-236 (2012). Leuthardt, E. C., Miller, K. J., Schalk, G., Rao, R. P. N., Ojemann, J. G. Electrocorticography-based brain computer Interface-the seattle experience. Neural Systems and Rehabilitation Engineering, IEEE Transactions on. 14, 194-198 (2006). Leuthardt, E. C., Schalk, G., Wolpaw, J. R., Ojemann, J. G., Moran, D. W. A brain-computer interface using electrocorticographic signals in humans. Journal of neural engineering. 1, 63-71 (2004). Talairach, J. New approach to the neurosurgery of epilepsy. Stereotaxic methodology and therapeutic results. 1. Introduction and history. Neurochirurgie. 20, Suppl 1. 1-240 (1974). Gonzalez-Martinez, J. Stereotactic placement of depth electrodes in medically intractable epilepsy. Journal of neurosurgery. 120, 639-644 (2014). Sheth, S. A. Human dorsal anterior cingulate cortex neurons mediate ongoing behavioural adaptation. Nature. 488, 218-221 (2012). Hayden, B. Y., Platt, M. L. Neurons in anterior cingulate cortex multiplex information about reward and action. The Journal of neuroscience : the official journal of the Society for Neuroscience. 30, 3339-3346 (2010). Hayden, B. Y., Pearson, J. M., Platt, M. L. Fictive Reward Signals in the Anterior Cingulate Cortex. Science. 324, 948-950 (2009). Williams, Z. M., Bush, G., Rauch, S. L., Cosgrove, G. R., Eskandar, E. N. Human anterior cingulate neurons and the integration of monetary reward with motor responses. Nature neuroscience. 7, 1370-1375 (2004). Botvinick, M., Nystrom, L. E., Fissell, K., Carter, C. S., Cohen, J. D. Conflict monitoring versus selection-for-action in anterior cingulate cortex. Nature. 402, 179-181 (1999). Carter, C. S., Van Veen, V. Anterior cingulate cortex and conflict detection: an update of theory and data. Cognitive, Affective, & Behavioral Neuroscience. 7, 367-379 (2007). Botvinick, M. M., Cohen, J. D., Carter, C. S. Conflict monitoring and anterior cingulate cortex: an update. Trends in cognitive sciences. 8, 539-546 (2004). Veen, V., Carter, C. S. The anterior cingulate as a conflict monitor: fMRI and ERP studies. Physiology & Behavior. 77, 477-482 (2002). Kennerley, S. W., Walton, M. E., Behrens, T. E. J., Buckley, M. J., Rushworth, M. F. S. Optimal decision making and the anterior cingulate cortex. Nat Neurosci. 9, 940-947 (2006). Brown, J. W., Braver, T. S. Learned predictions of error likelihood in the anterior cingulate cortex. Science. 307, 1118-1121 (2005). Bush, G., Shin, L. M., Holmes, J., Rosen, B. R., Vogt, B. A. The Multi-Source Interference Task: validation study with fMRI in individual subjects. Mol Psychiatry. 8, 60-70 (2003). Bush, G., Shin, L. M. The Multi-Source Interference Task: an fMRI task that reliably activates the cingulo-frontal-parietal cognitive/attention network. Nature protocols. 1, 308-313 (2006). Candelaria, L. M., Smith, R. K. Propofol infusion technique for outpatient general anesthesia. J Oral Maxillofac Surg. 53, 124-128 (1995). Shafer, A., Doze, V. A., Shafer, S. L., White, P. F. Pharmacokinetics and pharmacodynamics of propofol infusions during general anesthesia. Anesthesiology. 69, 348-356 (1988). Cohen, D. S., Lustgarten, J. H., Miller, E., Khandji, A. G., Goodman, R. R. Effects of coregistration of MR to CT images on MR stereotactic accuracy. J Neurosurg. 82, 772-779 (1995). Ken, S. Quantitative evaluation for brain CT/MRI coregistration based on maximization of mutual information in patients with focal epilepsy investigated with subdural electrodes. Magn Reson Imaging. 25, 883-888 (2007). Niemann, K., Naujokat, C., Pohl, G., Wollner, C., von Keyserlingk, D. Verification of the Schaltenbrand and Wahren stereotactic atlas. Acta neurochirurgica. 129, 72-81 (1994). Nowinski, W. L. Anatomical targeting in functional neurosurgery by the simultaneous use of multiple Schaltenbrand-Wahren brain atlas microseries. Stereotact Funct Neurosurg. 71, 103-116 (1998). Hopper, W. R., Moss, R. Common breaks in sterile technique: clinical perspectives and perioperative implications. AORN J. 91, 350-364 (2010). Mangram, A. J., Horan, T. C., Pearson, M. L., Silver, L. C., Jarvis, W. R. Guideline for prevention of surgical site infection. Hospital Infection Control Practices Advisory Committee. Infect Control Hosp Epidemiol. 20, 250-278 (1999). Asaad, W. F., Eskandar, E. N. A flexible software tool for temporally-precise behavioral control in Matlab. Journal of Neuroscience Methods. 174, 245-258 (2008). Asaad, W. F., Eskandar, E. N. Achieving behavioral control with millisecond resolution in a high-level programming environment. Journal of Neuroscience Methods. 173, 235-240 (2008). Bokil, H., Andrews, P., Kulkarni, J. E., Mehta, S., Mitra, P. P. Chronux: A platform for analyzing neural signals. Journal of Neuroscience Methods. 192, 146-151 (2010). Bokil, P. M. aH. Observed Brain Dynamics. Oxford University Press. (2008). Chronux. Available from: http://chronux.org (2014). Miller, K. J. Broadband Spectral Change: Evidence for a Macroscale Correlate of Population Firing Rate. The Journal of Neuroscience. 30, 6477-6479 (2010). Buzsáki, G., Anastassiou, C. A., Koch, C. The origin of extracellular fields and currents — EEG, ECoG, LFP and spikes. Nat Rev Neurosci. 13, 407-420 (2012). Carter, C. S. Anterior cingulate cortex, error detection, and the online monitoring of performance. Science. 280, 747-749 (1998). Holroyd, C. B., Coles, M. G. The neural basis of human error processing: reinforcement learning, dopamine, and the error-related negativity. Psychological review. 109, 679-709 (2002). Shenhav, A., Botvinick, M. M., Cohen, J. D. The expected value of control: an integrative theory of anterior cingulate cortex function. Neuron. 79, 217-240 (2013). Roesch, M. R., Olson, C. R. Neuronal Activity Related to Reward Value and Motivation in Primate Frontal Cortex. Science. 304, 307-310 (2004). Croxson, P. L. Quantitative Investigation of Connections of the Prefrontal Cortex in the Human and Macaque using Probabilistic Diffusion Tractography. The Journal of Neuroscience. 25, 8854-8866 (2005). Rushworth, M. F. S., Behrens, T. E. J., Rudebeck, P. H., Walton, M. E. Contrasting roles for cingulate and orbitofrontal cortex in decisions and social behaviour. Trends in Cognitive Sciences. 11, 168-176 (2007). Kawasaki, H. Single-neuron responses to emotional visual stimuli recorded in human ventral prefrontal cortex. Nat Neurosci. 4, 15-16 (2001). Wang, S. Neurons in the human amygdala selective for perceived emotion. Proceedings of the National Academy of Sciences. 111, E3110-E3119 (2014). Milad, M. R., Rauch, S. L. The role of the orbitofrontal cortex in anxiety disorders. Annals of the New York Academy of Sciences. 1121, 546-561 (2007). Milad, M. R., Rauch, S. L. Obsessive-compulsive disorder: beyond segregated cortico-striatal pathways. Trends Cogn Sci. 16, 43-51 (2012). Raichle, M. E. A default mode of brain function. Proceedings of the National Academy of Sciences of the United States of America. 98, 676-682 (2001). David, N. Neural representations of self versus other: visual-spatial perspective taking and agency in a virtual ball-tossing game. Journal of cognitive neuroscience. 18, 898-910 (2006). Kjaer, T. W., Nowak, M., Lou, H. C. Reflective self-awareness and conscious states: PET evidence for a common midline parietofrontal core. NeuroImage. 17, 1080-1086 (2002). Kircher, T. T. The neural correlates of intentional and incidental self processing. Neuropsychologia. 40, 683-692 (2002). Addis, D. R., McIntosh, A. R., Moscovitch, M., Crawley, A. P., McAndrews, M. P. Characterizing spatial and temporal features of autobiographical memory retrieval networks: a partial least squares approach. NeuroImage. 23, 1460-1471 (2004). Gilboa, A., Winocur, G., Grady, C. L., Hevenor, S. J., Moscovitch, M. Remembering our past: functional neuroanatomy of recollection of recent and very remote personal events. Cerebral cortex (New York, N.Y. : 1991). 14, 1214-1225 (2004). Cavanna, A. E., Trimble, M. R. The precuneus: a review of its functional anatomy and behavioural correlates. Brain: a journal of neurology. 129, 564-583 (2006).